The Wall of Voodoo songwriter performs on Friday, August 28th. In the late Seventies, Stan Ridgway had a soundtrack production company across the street from The Masque, a fixture in the nascent Los Angeles punk scene. 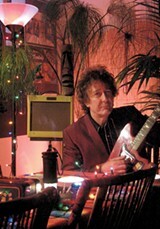 From the unlikely collision emerged Wall of Voodoo, a vessel of atmospheric terror, new wave instrumentation, and Ridgway’s noir themes that produced a substantial catalogue beyond its sole hit, “Mexican Radio.” Further, Ridgway’s post-Wall of Voodoo output is likewise rewarding: The Big Heat, his debut solo album from 1986, featured “Drive, She Said,” a cabbie’s first-person recollection of being happily forced to play getaway driver for a bank robber. Memorably, Ridgway collaborated with The Police’s Stewart Copeland on “Don’t Box Me In,” from the soundtrack to Francis Ford Coppola’s impeccably stylized Rumble Fish. The bleak portrait of fraternal camaraderie dovetails neatly with Ridgway’s haunted, cracked songs, which remain strong on his most recent album, Mr. Trouble. Ridgway performs at Freight & Salvage (2020 Addison St., Berkeley) on Friday.